Also, since I haven't seen one of the 97+ ones in person yet, is the side shown in the photo the exposed side when it's mounted? Does it need a center mounting bracket like the older ones? If so do you have that too? Is this still available? Also, since I haven't seen one of the 97+ ones in person yet, is the side shown in the photo the exposed side when it's mounted? Does it need a center mounting bracket like the older ones? If so do you have that too? Thanks! The entire speaker "bar" is on top of the headliner. Nothing is exposed but the speaker covers and where the light mounts if the cover is off. You would not even know that speaker holder is above the headliner. 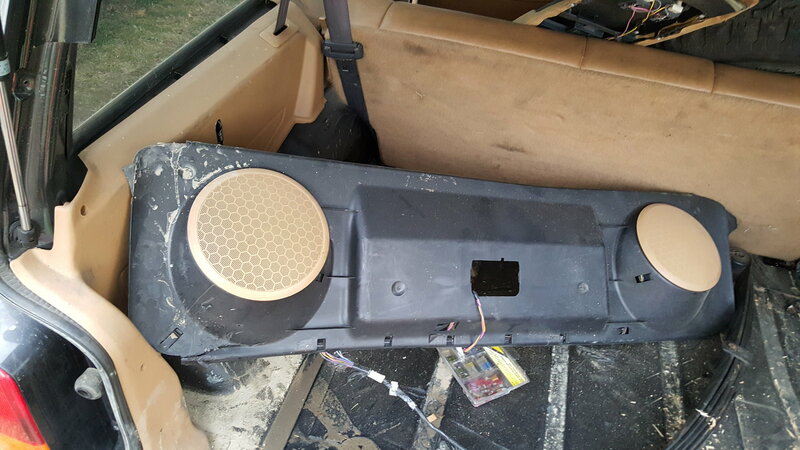 It's not like the 97 and older Cherokees with speakers bars that can be taken out without removing the headliner. In that case I'll stop hunting for a 98+ and try to get my hands on a mounting bracket for a 97-, because I have a 97- speaker bar laying around and I've checked that it fits in my 99 (which didn't come with the speaker bar option from the factory), so I just need to get it mounted properly. Locations on XJ for Hi-Lift Jacking?